Agalma is an automated workflow for transcriptome assembly and phylogenomic analysis developed by the Dunn Lab at Brown University. 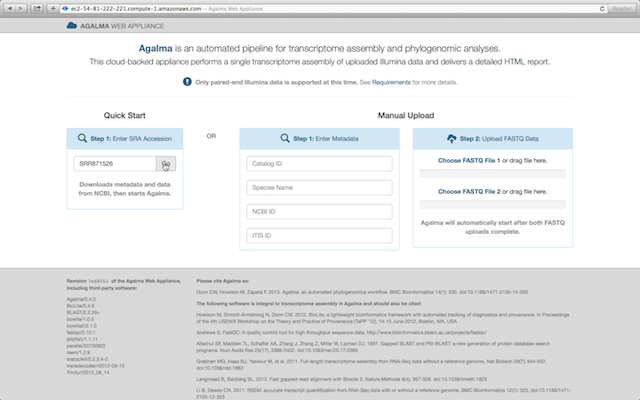 The Agalma Web Appliance is a pre-configured, easy-to-use image for performing a transcriptome assembly of paired-end Illumina RNA-Seq data in the cloud. We recommend choosing a c3.8xlarge instance (32 cores, 60GB memory) and configuring a security group that only opens TCP port 80 (HTTP) to your local IP address. Advanced: To launch an instance with the EC2 command-line tools, call ec2-run-instances specifying the AMI ami-e4c8208c along with a security group and key that you have previously configured. Getting Started with the Agalma Web Appliance on Vimeo.